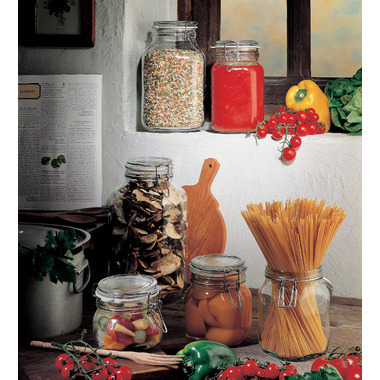 Fido glass jars by Bormioli Rocco are as practical as they are pretty! These vintage-looking airtight storage jars are eye-catching enough to showcase on the kitchen counter, attractively storing and displaying rice, pasta, beans and more. 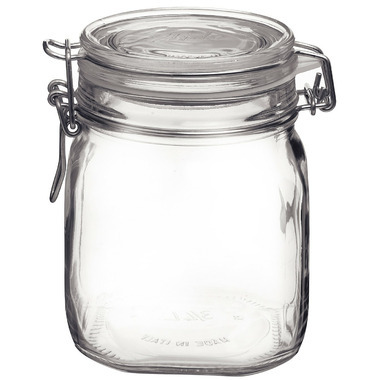 Each high quality glass jar features an airtight seal with replaceable rubber gasket to keep foods fresh longer, while the easy-open metal clasp safely keeps a lid on things! Chef's tip: extend the life of your reusable Fido jars by removing the rubber seal before placing the jars in the dishwasher. It's also a good idea to replace the rubber seal before reusing the lid. You'll want to store foods with a high fat content in a different container, as fat tends to adversely affect the rubber seal. Ideal For Terrine, Jams, Spices, Dessert Etc. Hermetic Closure. I love all these Bormioli Rocco Fido Jars. Because they're square-ish, they hold more than completely round jars, plus they line up beautifully on the shelf. I'd love to get more of them.